A little blog about Hua Hin from the balmy landing path to the Bo Fai International Airport, just minutes from the Hua Hin metroplex. Stay tuned for the rants and raves on living in Hua Hin, Thailand. For more detailed information on Hua Hin, please click the Hua Hin Pages link on the sidebar. Sponsored by Frangipani.com Comments are encouraged and Aliases are no problem. Anyone know what's going on at Satukarn Sqaure? Drove by today and saw what looked like they were taking the whole place down. Are we in for for another condo or perhaps a parking lot? No one likes to spread stories, least of all FBF, but the word is that the new hole on Petchkasem behind what used to be the District Office and the Police Station, may very well be the new Immigration Office. If it's true, you heard it here first; if it's not true, blame it on Not The Nation. FBF did the one year today and a casually dressed, name not given, immigration official, or not, said that he heard that Immigration would be in the present office for about one year. He hoped that the office would stay in suburban Bo Fai and NOT return to the jungles of Singh Khon, and understood (his italics, not mine) that the office going in where the sub office of the Red Cross was located on Petchkasem Rd. would be the new home of Immigration, opening around Songkran of next year. This unnamed, perhaps an official, perhaps just a rumor monger, didn't like the location on Soi 102 anymore than anyone else, but likes Singh Khon even less. FBF would like to see them stay in Bo Fai, obviously due to the amble free parking, but could live with the new location near the Post Office. Here's hoping rumors become reality. With Thais being hesitant to buy a second hand home or car due to the possibility of unwelcome spirits, it's not surprising that a building formerly housing a hospital would have problems finding tenants. If I remember correctly, this was originally the Thonburi Hospital and then Colin and his gang had it for a while. Since then, it became overgrown with weeds at the end of Soi only slightly better than Soi 102. However, ghosts or no ghosts, with or without potholes and a lack of parking (what's with this guy and parking? ), it's a heck of a lot closer than Singh Khon. Bo Fai gets an international airport, then an immigration office. What's next, a Top Charoen Optical shop? 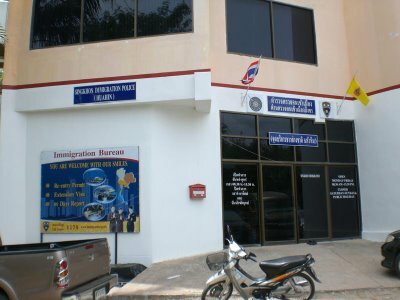 The word has been that Immigration will be moving from their beautiful tree lined Soi southwest of town back to Singh Khon, half way to Phuket. The word now is that they are moving to Soi 23, just north of the Index Mall. It's small soi, with relatively few pot holes and is much closer to downtown Bo Fai than their last office. The signs on the door this morning said the new office opens on Monday the 23rd so we will see. Hopefully all the cute college girls doing their summer intern programs will also be making the move.